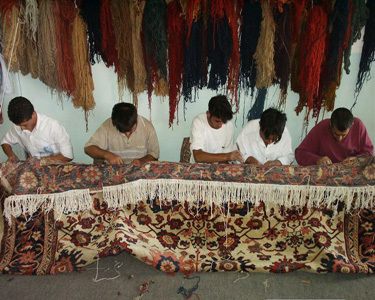 Rug store professionally trained technicians provide the highest quality of service with the best possible results in comprehensive Rugs and Kilims upholstery repair solutions, our years of experience are already recognized by major Oriental rug dealers. We use hand spun wool and tailor made vegetable dyes individually mixed for colour matching to suit the needs of the rug, with leading industry tools to handle your request with the up most effectiveness at affordable prices. Reweaving lost ends, restoring lost corners, water rot, moth damage, fixing holes with matching wool and restoring the lost designs, binding, fringes, reweaving bald spots etc. Are some of the works we do? If you have a damaged rug or kilim in need of repair please call or email us to give us some ideas about and nature of the damage. Our skills, whether it is conservation and restoration of tapestries, rugs and textiles, antique or modern pieces, are reputed worldwide. With this web site we hope to share our passion for textiles with you, professional restoration of rugs and Kilims, European tapestries and Aubusson. A' stitch in time saves nine' especially true for oriental rugs, where early attention to damaged areas will not only save you hundreds of stitches but hundreds of pounds. Damaged Oriental rugs and kilims can be repaired to give you many more years of use and pleasure. However it is important that repairs are undertaken by experts with the required special skills, so that an effective repair is carried out depending on the extent of the damage and the age of the rug. Rug Store has been in the business of repairing Oriental rugs of all types for over 25 years and has the experience to advise you as to the best course of action. Repairing rugs is a highly skilled craft that is comparable in technique and experience with the rug manufacturing process. For example to repair a hole requires that a compatible yarn is found to match that of the surrounding rug, so that the touch and feel of the repair is the same as that of the rest of the rug. The colour or colours of the yarn to repair the hole must be carefully selected so that it merges with the colours around it. The frayed yarn surrounding the hole must be dealt with depending on the extent of the damage, and finally the hole must be woven by hand using the appropriate knot so that it is practically invisible to the naked eye. One should be aware that it is always advisable to fix a damaged or worn rug as soon as possible so that further damage can be averted. This ensures a better quality repair at a lower cost as well as retaining or increasing the value of the rug. In cases where the rug is old (over 50 years) and valuable, we will advise you what Rug repairs London should be done to increase its value and at the same time improve its appearance and usability.